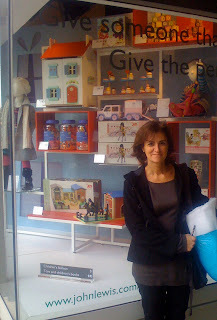 ooh very excited to see my products in the window of John Lewis before Christmas.... had to have this cheesy photo on the blog to remind me to think about work more often! don't know the store John Lewis, but maybe you should begin making a list of places we MUST see when we come this summer..right? absolutely love "seeing" you everyday. trying to talk sue into downloading Skype, too.